This has hands down been one of the most depressing winters I can remember. If it wasn't a polar vortex, it was snow, ice, and rain. The elements seemed to have it in for me, keeping me from my grill during those fleeting hours I could comfortably be tending to a fire. As the days are finally growing longer and weather slowly taking an upward turn, I needed a little pick-me-up to get me out of the funk I've found myself in and renew my spirit to tend to the flames. I decided a great prescription would be to relive the glory of a Cajun grilling kick I went on two summers ago. From jambalaya, to blackened catfish, to shrimp skewers, each dish during this time seemed to turn out incredible, and taking top honors among that crowded field were these Cajun spiced spare ribs. At the beginning of this foray into Cajun cooking, I mixed up a big ol' mess of Cajun seasoning, which served as the backbone of many of these recipes. Just like a standard barbecue rub, Cajun seasoning in layered and complex. It skips the sweetness though, so it's the heat that becomes most prevalent in this mixture that includes garlic powder, onion powder, paprika, salt, thyme, oregano, cumin, and three types of pepper—black, white, and cayenne. I gave a few racks of St. Louis-cut spares a thorough rub down with the seasoning. 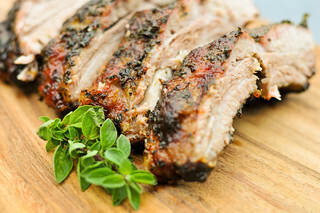 As I was massaging the spices into the meat, I enjoyed the change from the typical barbecue aroma to this more earthy and herbal mix, which already told of just how different these ribs would be. 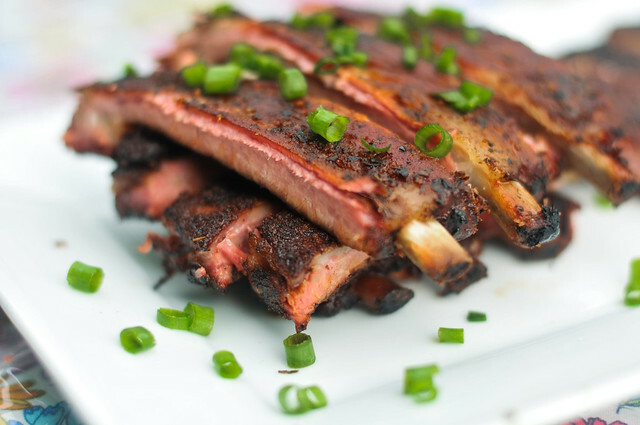 After being rubbed and rested—I personally like to let my seasoned ribs sit overnight in the fridge, but it's not a necessity by any means—they went into the smoker running at 225°F with some chunks of hickory thrown on top of the coals. I decided to do the 3-2-1 method with these, called such because it indicates smoking for three hours, then foiling and cooking for two hours more, than unfoiling and cooking one additional hour. I don't like the 3-2-1 name though, because I rarely follow those times. During the first smoke, I generally go by appearance rather than time. I'm looking for my ribs to develop a deep red bark, an indication the spices have set and won't fall off during the foiling stage. 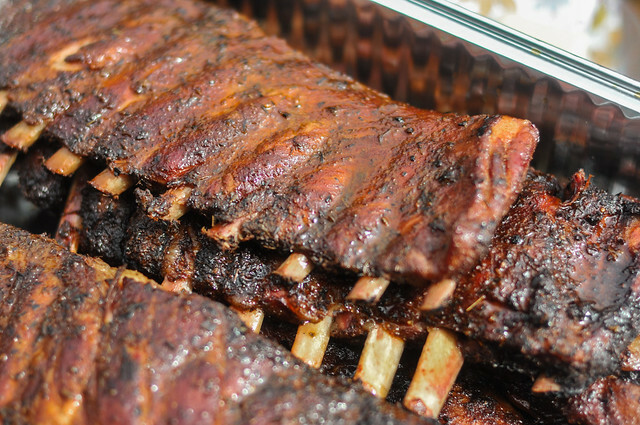 Once these racks reached the right appearance, I foiled them along with some liquid seasoning. I used this "braise" as a way to inject more Cajun flavor by making it up of beer, butter, Worcestershire, liquid crab boil, and Louisiana-style hot sauce. 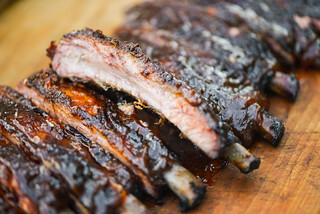 Once wrapped up, I let the ribs cook for one hour more on the smoker—I've found that foiling much more than an hour renders the meat on ribs too soft. 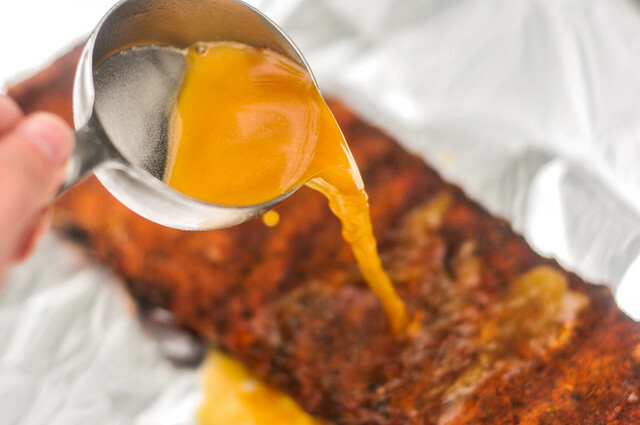 The ribs were then removed from the foil—with the liquid seasoning reserved—and placed back in the smoker. This time around I was looking for them to reach the right doneness, which I discern by lifting the ribs from one end and judging the bend. If the rack pulls up more or less without much bend, they're not done. If they have nice curve to them, then they're done. If they fall apart when lifted, then they're overdone (but still delicious). Off the smoker, I gave the ribs a final brushing of the reserved liquid seasoning that added a nice glisten to their "dry" bark, then dug in. 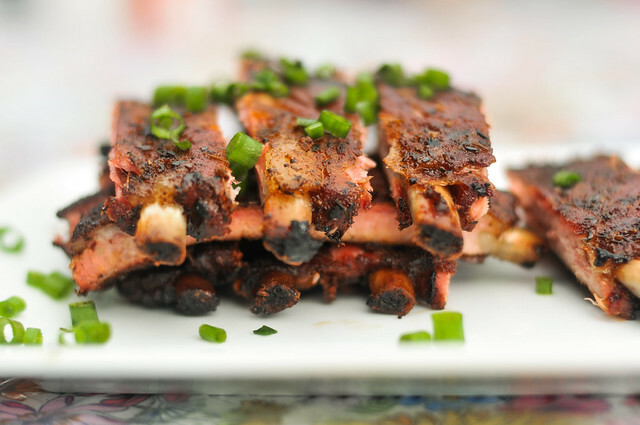 In contrast to traditional barbecue ribs, where the rub is usually a balance of sweet and spicy, these bones were more herbal, earthy, and had a nice kick of heat. The meat came out excellent too—smoky, moist, and with just the right pull-off-the-bone tenderness. It was a great use of some Cajun seasoning, and luckily I had so much that there was more than enough for the wings, catfish, and shrimp boil skewers that came later. 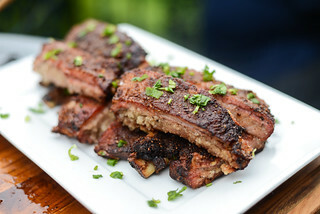 In contrast to traditional barbecue ribs, which usually strike a balance between sweet and spicy, these Cajun spares were more herbal, earthy, and had a nice kick of heat. 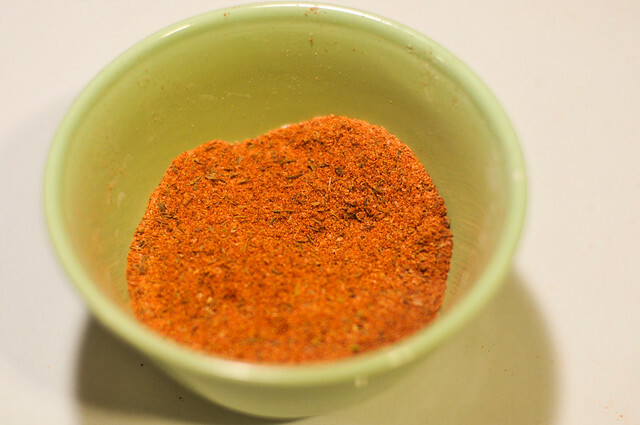 To make the rub: In a small bowl, mix together paprika, salt, sugar, garlic powder, onion powder, thyme, oregano, cumin, black pepper, white pepper, and cayenne pepper. Set aside. To make the liquid seasoning: In a medium bowl, whisk together beer, butter, Worcestershire sauce, liquid crab boil, and Louisiana-style hot sauce. Set aside. Fire up smoker or grill to 225 degrees, adding chunks of smoking wood when at temperature. 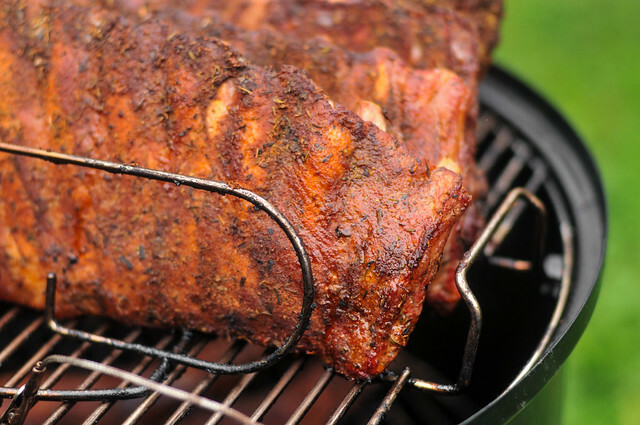 When wood is ignited and producing smoke, place ribs in smoker or grill, meat side up. Smoke until ribs darken to a deep rusty red color, about 3 hours. 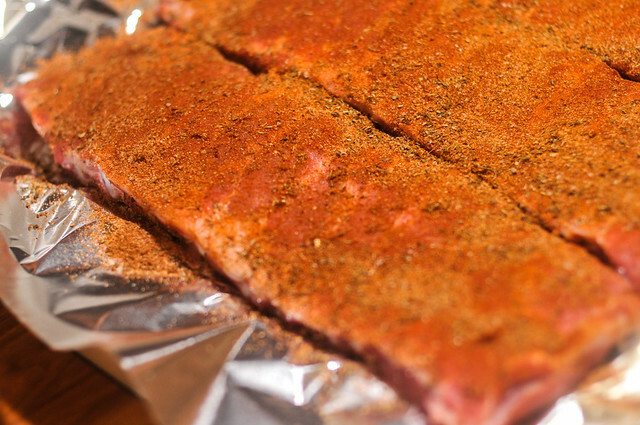 Lay each rack of ribs on top of a sheet of extra-large heavy duty aluminum foil; tilt foil edges upward. Pour half of liquid seasoning over each rack of ribs, then seal ribs in foil and place back on smoker or grill for 1 hour. Open one end of foil and pour liquid seasoning into a small bowl and reserve. Remove ribs from foil and place back in smoker and continue to cook until ribs have a slight bend when lifted from one end, 1-2 hours more. Remove ribs from smoker, brush with reserved liquid seasoning. Serve immediately. I've only tried to cook ribs a few times because the ribs you get here in Australia have very little meat on them. But I've not heard of the 3-2-1 system before and noticed you don't use it in all your recipes. Is it something you've recently started or do you only use it sometimes?